Explanation: The dust sculptures of the Eagle Nebula are evaporating. As powerful starlight whittles away these cool cosmic mountains, the statuesque pillars that remain might be imagined as mythical beasts. 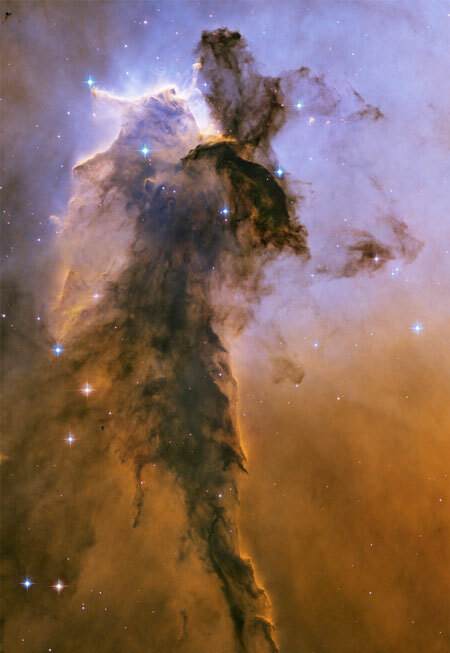 Pictured above is one of several striking dust pillars of the Eagle Nebula that might be described as a gigantic alien fairy. This fairy, however, is ten light years tall and spews radiation much hotter than common fire. The greater Eagle Nebula, M16, is actually a giant evaporating shell of gas and dust inside of which is a growing cavity filled with a spectacular stellar nursery currently forming an open cluster of stars. The above image in scientifically re-assigned colors was released as part of the fifteenth anniversary celebration of the launch of the Hubble Space Telescope.